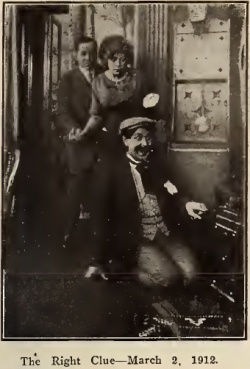 The Right Clue is an American silent movie released on 2 march 1912 (in USA), produced by Imp Films Co. Black & White. Split reel (600 feet). Parodic movie written by Louise Carter after wining the writing contest by Imp Films Co.
Novelists, dramatists and scenario writers are fond of "clue" themes. The illustrious Sherlock Holmes, it will be remembered, makes many wonderful discoveries on what seems to be very slender evidence. It is a trick of the stage detective and the detective of the novel to evolve something out of nothing, but the audience and the reader like this sort of pabulum. They like to see the mystery solved by just this sort of slender material or evidence. Miss Carter very adroitly avails herself of this fact. The central idea of her story is an exceedingly clever one. Some papers mysteriously disappear; the clue, the right clue, to the mystery is some cigar ash. Detective W. R. Daly seizes this clue and he follows it up patiently, persistently and pertinaciously, until he finally locates the missing documents in the hat of a policeman. Just imagine that! Some papers disappear, some cigar ash is found, and by means of this cigar ash the papers are traced and recovered. This very clever piece of comedy work is bound to make your patrons laugh, Mr. Exhibitor-Man. 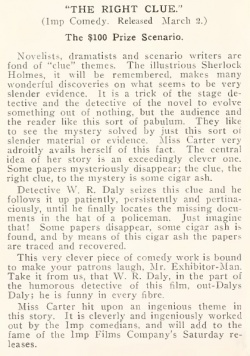 Take it from us, that W. R. Daly, in the part of the humorous detective of this film, out-Dalys Daly; he is funny in every fibre. Miss Carter hit upon an ingenious theme in this story. It is cleverly and ingeniously worked out by the Imp comedians, and will add to the fame of the Imp Films Company's Saturday releases. The Imp Film Company's $100 Scenario. 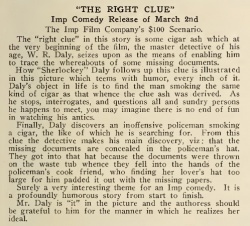 The "right clue" in this story is some cigar ash which at the very beginning of the film, the master detective of his age, W. R. Daly, seizes upon as the means of enabling him to trace the whereabouts of some missing documents. How "Sherlockey" Daly follows up this clue is illustrated in this picture which teems with humor, every inch of it. Daly's object in life is to find the man smoking the same kind of cigar as that whence the clue ash was derived. As he stops, interrogates, and questions all and sundry persons he happens to meet, you may imagine there is no end of fun in watching his antics. Finally, Daly discovers an inoffensive policeman smoking a cigar, the like of which he is searching for. From this clue the detective makes his main discovery, viz : that the missing documents are concealed in the policeman's hat. They got into that hat because the documents were thrown on the waste tub whence they fell into the hands of the policeman's cook friend, who finding her lover's hat too large for him padded it out with the missing papers. Surely a very interesting theme for an Imp comedy. It is a profoundly humorous story from start to finish. Mr. Daly is "it" in the picture and the authoress should be grateful to him for the manner in which he realizes her ideal. Mrs. Phillips sent her confidential business man a parcel of bonds to deposit in a place of safety. Mr. Forbes, the gentleman in question, was about to put them in a safe when an interruption took him from the room, and the precious papers found their way into the waste-paper basket, and, subsequently, into the waste can out of doors. A detective being called in, discovered in the course of his investigations some cigar ash and comes to the conclusion that the man who smokes this kind of cigar must be the recipient or custodian of the lost bonds. The detective following up this clue examines the cigars smoked by a great many persons, much to their discomfiture and his own inconvenience. Finally, he comes across a policeman smoking the identical brand of cigar and this fact leads to the discovery that the lost documents are concealed in the policeman's hat, the same being placed there by his sweetheart, the cook, who thinks the hat too large to be becoming and thus pads it out sufficiently for a good fit. And so the cigar ash proved the right clue which led to the recovery of the documents and their return to the proper owner. The leading feature of the film is the ingenious and logical way the story is worked out. It is provocative of much laughter and abounds in amusing situations. 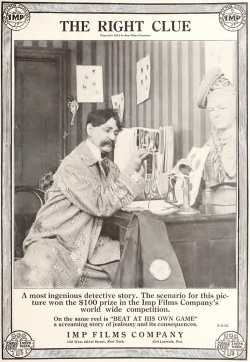 The character of the detective is played by W. R. Daly, who gives a burlesque rendering of the part of the sleuth. Mr. Shay is the man of business who mislaid the bonds, and the parts of the policeman and the cook whom he goes to visit are humorous in the extreme. As an example of the logical working out of the comedy plot in "The Right Clue" it will probably appeal to close students of well-constructed moving picture comedies. This page was last edited on 21 January 2016, at 14:47.